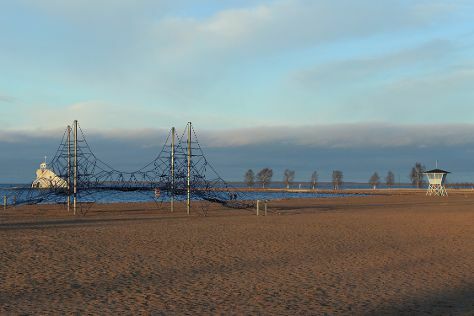 On the 17th (Sat), take in panoramic vistas at Pyynikki Park and Observation Tower, kick back and relax at Rauhaniemi Beach, then contemplate in the serene atmosphere at Tampere Cathedral, and finally contemplate in the serene atmosphere at Vanha Kirkko. On the 18th (Sun), you'll have a packed day of sightseeing: get in on the family fun at Sarkanniemi Theme Park. To see ratings, other places to visit, reviews, and other tourist information, you can read our Tampere vacation planner. London, UK to Tampere is an approximately 7.5-hour combination of flight and train. You can also fly; or do a combination of train, car, and ferry. The time zone changes from Greenwich Mean Time to Eastern European Time, which is usually a 2 hour difference. Traveling from London in August, Tampere is little chillier at night with lows of 11°C. Finish your sightseeing early on the 18th (Sun) so you can drive to Pori. Pori is a city and municipality on the west coast of Finland. On the 19th (Mon), admire the striking features of Palace of Junnelius, shop like a local with Pori Art Museum, then don't miss a visit to Juselius Mausoleum, and finally kick back and relax at Yyteri Beach. To see where to stay, maps, and other tourist information, refer to the Pori attractions planner. You can drive from Tampere to Pori in 1.5 hours. Alternatively, you can take a bus; or take a train. In August, daytime highs in Pori are 22°C, while nighttime lows are 12°C. Cap off your sightseeing on the 19th (Mon) early enough to go by car to Turku. Kick off your visit on the 20th (Tue): kick back and relax at Ispoinen Beach and Sauna, examine the collection at Luostarinmaki Handicrafts Museum, then steep yourself in history at Aboa Vetus & Ars Nova, and finally take in the spiritual surroundings of Turku Cathedral. Here are some ideas for day two: browse the collection at Turku City Library, explore the historical opulence of Turku Castle, and then kick back and relax at Vepsa Island. For more things to do, ratings, traveler tips, and tourist information, use the Turku online travel route builder . You can drive from Pori to Turku in 2 hours. Another option is to take a bus. In August in Turku, expect temperatures between 23°C during the day and 12°C at night. Cap off your sightseeing on the 21st (Wed) early enough to go by car to Helsinki. Your cultural itinerary includes sights like Rock Church and Helsinki Cathedral. Deepen your sense of the past at sights like Sea Fortress Suomenlinna and Kamppi Chapel of Silence. Pack the 25th (Sun) with family-friendly diversions at Linnanmaki Amusement Park. There's lots more to do: contemplate in the serene atmosphere at Uspenskin Cathedral (Uspenskin Katedraali), explore the world behind art at Kansallisgalleria, appreciate the extensive heritage of The Esplanadi Park, and stroll through Aurinkolahti Beach. For maps, more things to do, and tourist information, you can read our Helsinki trip maker site . Traveling by car from Turku to Helsinki takes 2 hours. Alternatively, you can take a train; or fly. In August in Helsinki, expect temperatures between 24°C during the day and 13°C at night. Cap off your sightseeing on the 26th (Mon) early enough to go by car to Kotka. Kotka is a city and municipality of Finland.Kotka is located on the coast of the Gulf of Finland at the mouth of Kymi River and it is part of the Kymenlaakso region in southern Finland. Kick off your visit on the 27th (Tue): head off the coast to Varissaari - Fort Elisabeth, stroll through Beach Mansikkalahti, then get to know the fascinating history of St. Nicholas Orthodox Church, and finally take in nature's colorful creations at Sapokka Water Garden. For other places to visit, ratings, reviews, and more tourist information, use the Kotka visit planner . Traveling by car from Helsinki to Kotka takes 1.5 hours. Alternatively, you can take a bus. August in Kotka sees daily highs of 23°C and lows of 13°C at night. 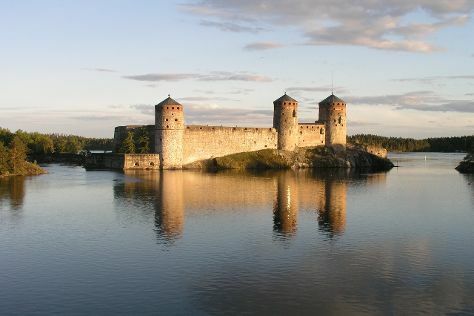 Wrap up your sightseeing on the 27th (Tue) to allow time to drive to Savonlinna. On the 28th (Wed), look for gifts at Taito Shop Savonlinna, pause for some serene contemplation at Savonlinna Cathedral, pause for some photo ops at Savonlinna Herostatue - The Hero's Grave, then see the interesting displays at Savonlinna Provincial Museum, then step into the grandiose world of Olavinlinna Castle, and finally contemplate in the serene atmosphere at Kerimaki Church. For where to stay, maps, traveler tips, and tourist information, refer to the Savonlinna vacation website . You can drive from Kotka to Savonlinna in 3.5 hours. Alternatively, you can take a train; or take a bus. In August, daytime highs in Savonlinna are 22°C, while nighttime lows are 13°C. Cap off your sightseeing on the 28th (Wed) early enough to travel to Oulu. Oulu is a city and municipality of inhabitants in the region of Northern Ostrobothnia, Finland. 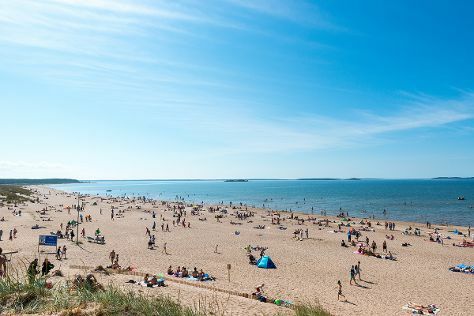 On the 29th (Thu), kick back and relax at Nallikari Beach and then soothe aching muscles at some of the top local wellness centers. To see other places to visit, maps, traveler tips, and tourist information, use the Oulu day trip tool . Fly from Savonlinna to Oulu in 6 hours. Alternatively, you can drive; or do a combination of train and flight. Expect a daytime high around 22°C in August, and nighttime lows around 12°C. Finish your sightseeing early on the 29th (Thu) to allow enough time to travel back home.